Use your last-minute Christmas present shopping as a great excuse for a short European shopping break! There are some fantastic places to shop in Europe, from large shopping malls to tiny backstreets, as well as the superb Christmas markets that are to be found during the festive period. But for the ultimate in fabulous choice these five destinations are the best of the best when it comes to last-minute Christmas present shopping. Bruges is very much a Christmas city. Even when it’s not lit up for Yuletide, the place can’t seem to help itself when it comes to giving off that Christmassy vibe. So it’s not entirely surprising that it’s a wonderful place to go shopping. This is where your spirit of adventure will combine with the spirit of Christmas as you discover previously unknown and unseen boutiques offering chocolate, beer, wooden toys, Christmas decorations, and the famous Bruges lace. If you like designer names and gorgeous pieces of clothing and accessories, then the Golden Mile in Puerto Banus, Spain, is the place for you. Not for the thrifty, this is a place where you can spend, spend, spend, and have the time of your life doing it surrounded by huge yachts and huger wallets. This is where the rich and famous go to shop, so you know you will be in excellent company as you browse stores including Fendi, Armani, Versace, and D&G. There is also a five storey department store in El Corte Ingles where you can find more high street branded items and familiar chains. Once your shopping is done, sit and relax with the in crowd before heading back home. 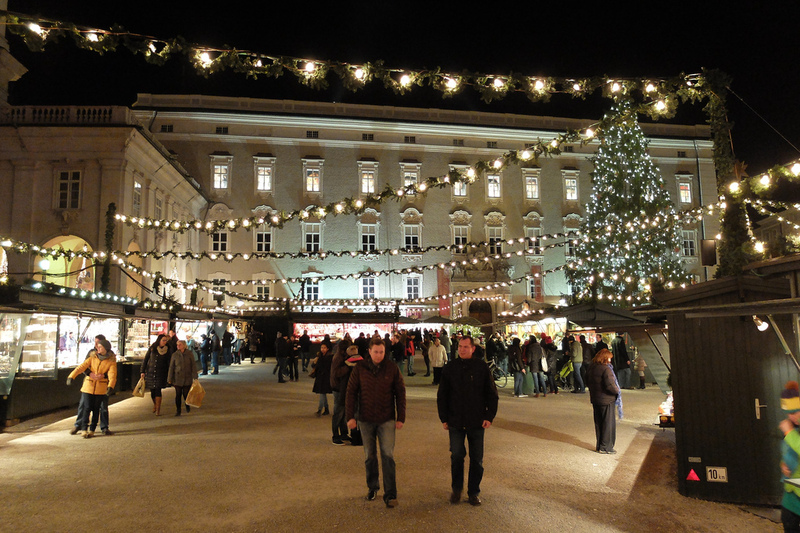 Not only can you do a load of Christmas shopping in this Austrian town, you can do a load of sightseeing too – combine the two and enjoy a marvellous day or two soaking up the culture and the atmosphere. This is the place to come to find something gorgeous and handmade, and if that is what you are looking for, you should head straight for the Getreidegasse. This street is lined with shops that are more like treasure troves or Aladdin’s caves, and exploring them is so much fun! Of course, Germany is jam packed full of excellent places to carry out your Christmas shopping; Germany does Christmas very well indeed. But if you have to pick just one, then Mainz should be at the top of the list. Here you will be doing your gift picking in a 5,000 year old Roman temple – that’s something special! It’s called the Romerpassage Shopping Centre, and it has 17,000m2 to enjoy. I can’t forget London in a list of the best places to do your Christmas shopping in Europe, though it is sometimes overlooked as it is on the doorstep. There is a certain something in the air around Christmas time in London, a buzz of excitement that is difficult to define. What’s not difficult is finding a fantastic shop or fifty to pick your gifts from. Oxford Street is brimming with choice (and the lights are worth checking out too), as is Regent Street, but there is so much more than that. Why not try Harrods in Knightsbridge for some truly decadent shopping, or Hamleys to help Father Christmas out with the little ones? Head to Europe on a mini cruise break.